Paul Glatzel and Bobby Duncan have combined with devastating effect this season for Liverpool’s U18s, scoring a plethora of brilliant goals. 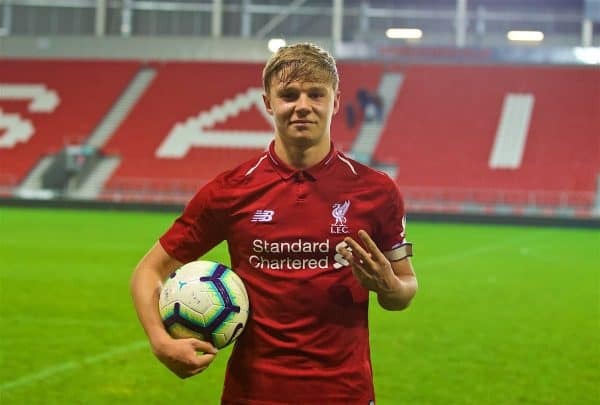 Glatzel and Duncan have struck up a prolific partnership following the latter’s summer move from Man City, and they have been the standouts for Liverpool’s U18s side this season. The duo have both reached the 20-goal milestone already this season, with Glatzel hitting 21, having regularly exhibited an unselfish style of play which, in tandem with their natural goalscoring abilities, has the young Reds sitting atop the U18 Premier League table. Their goalscoring feats both domestically and in the UEFA Youth League have Barry Lewtas’ side primed for a successful hunt for silverware this season. In a video released by the club we can see how deadly the duo are in front of goal, and the range of finishes in their arsenal. Glatzel, the U18s’ skipper, and Duncan are both capable of playing with their back to goal and peeling off defenders, where their poise in the goalmouth is often as impressive as their finishing. This has seen Glatzel net an impressive league hat-trick against West Brom and Duncan seal a stunning four-goal haul against Middlesbrough. More impressively, however, is that of the U18s’ 12 league games to date, the pair have played alongside one another on nine occasions and only once have neither failed to have a direct impact on the scoreboard. But with plenty of games left in the campaign both Glatzel and Duncan will be looking to keep the goals flowing and add to their already impressive highlight reel.